If you’re using Windows 7 you may have noticed that you can simply drag the task bar tabs left or right and change their positions. But, you can’t do the same thing in Windows XP and Vista. Don’t you worry! There’s a software- Taskix which helps you to get this feature on Vista and XP. Taskix is a freeware that enables you to change the default order of the taskbar tabs in Windows XP and Vista. To reorder or rearrange the taskbar tabs, all you need to do is just drag-and-drop a particular tab to the position you desire. It also has an awesome feature which allows you to scroll between tabs using the mouse wheel. To enable this feature you need to set some settings. 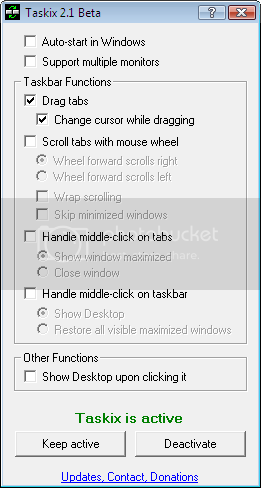 The “Scroll tabs with mouse wheel” option and also the “Handle middle-click on tabs” > “Close Window” option should be ticked. Once done, Click on the “Activate” button.